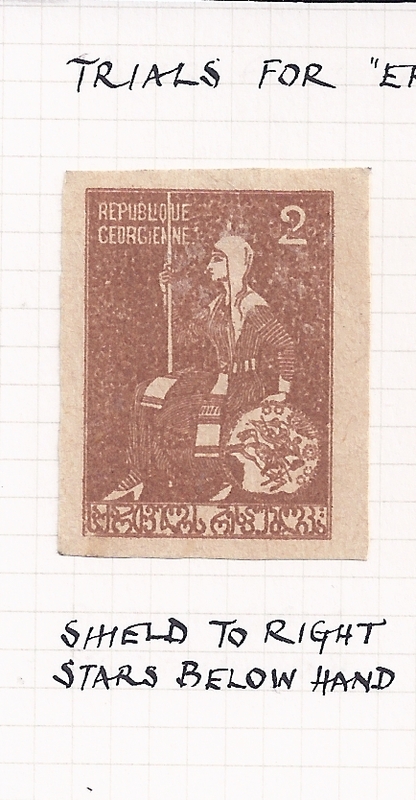 In a collection of the 1919 - 21 St George and Tamara stamps of Georgia, Peter Ashford devoted a section to the so-called "Freak" varieties. These were deliberately created varieties which were inserted into just part of the total printing and were not released for postal use, though some of the sheets with varieties were later used for the National Guard and de Jure overprints. Normally, there is just one variety in a large sheet of 12 x 12 or 12 x 13. 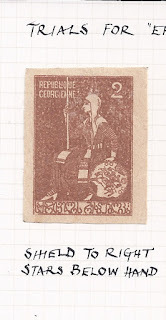 For the Tamara stamps, the 2 rouble variety is an inverted "2", for the 3 rouble an inverted "5", and for the 5r rouble "Tamara asleep" - this is the most popular of the Freaks. - next three stamps, shield still rotated on the 2 rouble and in addition the 3 rouble printed on the reverse with a variety, Diagonal Line below the number "3"
Now, my question is this. I cannot recall seeing these "Trial" Freaks in large multiples whereas I have seen the standard Tamara Freaks in complete sheets - and have them in stock in sheets at this moment. Does any reader have these so-called "Trial" Freaks in large multiples, I wonder? As a small aside, the printing and paper quality on these "Trial" Freaks is poor whereas the regular Tamara Freaks are often well printed on gummed white paper .